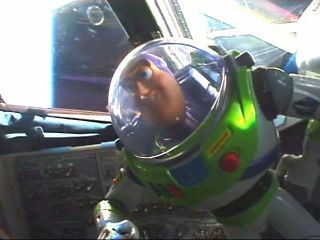 Buzz Lightyear floats aboard the space shuttle Discovery after being launched in May 2008. Space shuttle Discovery undocked from the InternationalSpace Station (ISS) Tuesday with six NASA astronauts, one European Space Agency(ESA) mission specialist and a Star Command Space Ranger for the trip back toEarth. Yes, that's right, Buzz Lightyear is on his way home. The animated astronaut has been on a real space mission inthe form of a 12-inch tall action figure since launching lastyear aboard Discovery's STS-124 mission, as part of an educationalpartnership between NASA and the Walt Disney Company. Buzz is returning with the STS-128 crew, including spacestation flight engineer Tim Kopra who spent 44 days living on the ISS. Bycomparison, Lightyear will have logged 467 days in space, assuming that theweather in Florida does not delay his scheduled landing on Thursday evening. That is a record, says Disney, pointing out that Lightyear'sstay surpasses the longest duration space mission set in 1995 by Russiancosmonaut Valery Polyakov by a month. During his time on-board the station, with the help of hiscrewmates, Lightyear has been the star of recorded videos that are aimed atexciting children about spaceflight, while teaching them the basics of workingin weightlessness. A similar goal is shared by other items returning with the STS-128astronauts. Although in space for less time than Buzz, just 13 days, theastronauts each packed items to thank those who supported them while helpingpromote the role space exploration plays back on Earth. Buzz Lightyear is not the only toy aboardDiscovery. STS-128 pilot Kevin Ford, making his first flight, brought aseven-inch model of the space shuttle for his elementary school and as aHoosier, a model car for the Indianapolis Motor Speedway in Indiana. Swedish astronaut Christer Fuglesang, who coincidentallycombined both of Ford's items in the form of candyhe flew for his crewmates, chose among his mementos a chess piece for the Swedish Chess Academy. The wood-carved knight, like the shuttle and car models,were stowed inside the STS-128 Official Flight Kit, a duffle bag-sizedcontainer of souvenirs flown at the request of the astronauts and the spaceagency. The items it carries remain out of reach of the crew for the length ofthe flight. Which is why Fuglesang, who also flew a mini frisbee, wasunable to best his own record on this mission. Once a Swedish national frisbeechampion, Fuglesang on his first flight in 2006 set a record for "timealoft" by floating a spinning frisbee for 20 seconds aboard the ISS. With his chess piece and frisbee out of reach, Fuglesangdevised other means of sharing a game from space. Challenging the public to a chess match, Fuglesang built aboard on the back page of the mission checklist. "I needed some kind of chess board and so I made it outof Velcro for myself," he explained in a pre-flight interview withcollectSPACE. Using blue and yellow hook-and-latch squares, Fuglesang affixedpaper pieces that he moved in response to e-mailed challenges. As of Wednesday, the Swedish media was reporting thatFuglesang's rook, guarding his queen, might be in trouble. "I am kind of a good amateur player," Fuglesangsaid of his own abilities. "When I was a teenager, I played for two yearsin a club and did a bit of competition, but I never raised above average." Fuglesang is not flying the white flag to surrender justyet, though the completion of his chess match, which began before he launched,may not come until after he lands. He is however, flying the Swedish flag. The blue and yellow banner, which is also featured on theSTS-128 crew's mission patch, is among a collection of flags inside the OfficialFlight Kit. "I am flying a couple of flags," shared JoseHernandez, whose family were Mexican migrant workers. "One is for asquadron from Mexico that participated in World World II. They asked me to flytheir squadron's flag. I am flying a Mexican flag that I will present toPresident Calderon when I return." Danny Olivas, who like Hernandez is a mission specialist ofMexican descent, chose to highlight another country's role in his youth. "The country of Bhutan and my alma mater, University of Texas at El Paso, share an affiliation. The architecture at UTEP is all Bhutanesearchitecture and so the country, their government, and UT El Paso have a prettyclose relationship and so in discussions with the folks at UTEP and withrepresentatives of the country, we were able to get a flag." Ford, in addition to packing models, brought a flag for oneof his schools, the Air Force Institute of Technology. "Although they have graduated many astronauts, I do notthink they had ever had anything ever offered to them. So I am flying theirflag and they are going to hang it back in their entry way and make a littlenote underneath about their contribution to the astronaut corps," saidFord. For astronaut Pat Forrester the chance to fly a flag waseven more personal. "During the training for this flight, my father passedaway. He was my biggest fan, loved space, loved NASA. So he was 30 years withthe military, a West Pointer just like me and he was buried at Arlington [Cemetery] in September. And the honor guard that did his service, I am flyingtheir guidon and will present that back to them when I get back ? just a way ofthanking them for the way that they honored him in his burial." As Forrester mentioned, the crew members will embark on toursof the country, and to Sweden and other international destinations, to returnthe items they flew. "Hopefully, [these items] will serve as motivation forkids and for people who are part of the organization that once presented tothem, will say 'Hey, if they did it, why can't I do it? '," said Hernandez. One such opportunity is set for early October when Disneyplans a ticker-tape parade at the Magic Kingdom in Florida to welcome BuzzLightyear back to Earth, together with several of his NASA space stationcrewmates. Read the completecontents of the STS-128 Official Flight Kit at collectSPACE.com.